With all its design and technological content, the Vespa GTS Super 300 reinterprets a new sporty classic from the mighty Vespa collection. While plenty of functional details, like the USB port in the double compartment under the leg shield back plate, it certainly hasn't forgotten its racing spirit. The new two-tone alloy rims nod to the past and highlight the sporty attitude of the 145th model in Vespa’s history. The red spring of the front suspension and the new front grill add to the sporty feel. While the lights are now modern LEDs, in stark contrast, we still have a completely analog instrumentation, which harks back to racing traditions, offering a beautiful display of white numbers on a black background. The saddle is comprised of materials typical found on sporty Italian vehicles, and the body, the metal soul of the Vespa, has undergone some significant changes. 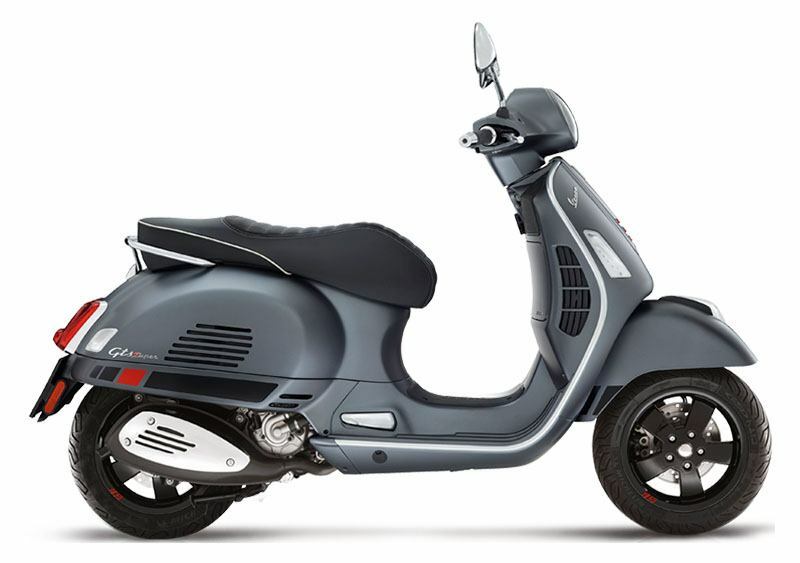 On the right hand side the horizontal grill nods to the most beautiful Vespa's of the past and gives an elegant sporty touch to the vehicle's profile. And for increased safety, the front and rear disc brakes are now equipped with ABS and Piaggio's ASR system.